Cultist Simulator is a “one person boardgame” from Alexis Kennedy, creative director and lead writer on Sunless Sea and Fallen London. It’s a fun, tactile game of studying the dark arts and performing human sacrifices. You begin Cultist Simulator with no occult knowledge at all. You must find a way to make money consistently, and then use that money to buy forbidden books. You’ll study those books to discover lore, study the lore to get rituals, use those rituals to gain dark power, and so on and so on. It feels like an experience meant for mobile in a lot of ways. You complete every action by clicking on the large, blocky tokens and slotting a card or two into them, and then waiting for a timer to go off. You’re rewarded with a card that gives you more avenues to go down in your quest for occult knowledge, be it a new book, location, a bit of lore, or just some money. As the game goes on and these processes become more complex, it feels pretty good to put all your ducks in a row and watch your plans go off without a hitch. That’s not to say I’ve truly mastered this game. In my brief time with it, I’ve been making a pretty shoddy cultist—did you know you can lose the game by dropping a “passion,” card into the “acceptance” slot at your clerical job? The more you know! Even if I haven’t amassed followers, there’s something satisfyingly tactile about the experience. The cards feel weighty, and the the sound of locking them into the wooden textured tokens has a nice echo. You kinda feel like you should be in a darkened library somewhere. While I was waiting for timers to cool down I’d sometimes just slide all the cards around. It helps to be organized. For fans of Sunless Sea and Fallen London, the game retains the same puckish sense of humor, as well as their tongue in cheek morbidity. Buying and studying books was, in some ways, my favorite part. The lore you divine from the books gave just enough of a glimpse into the unknown (“The Dark Sacrament,” “Manus-Glimpse”), while the descriptions of those books were chuckle-worthy, if you also think academia could occasionally use a good ribbing. 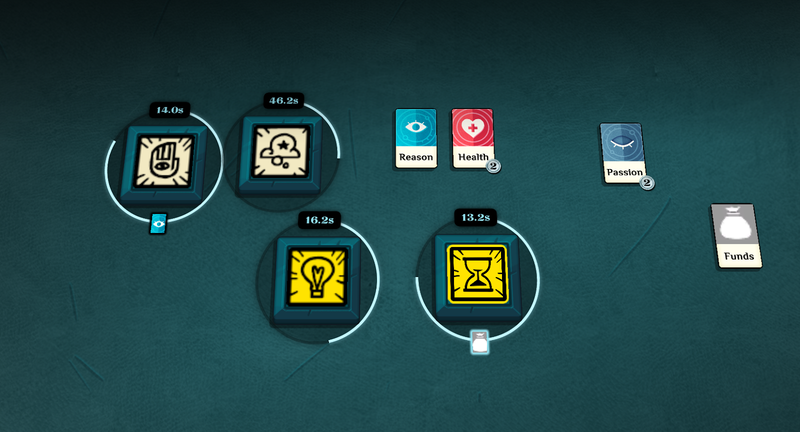 Cultist Simulator is available as a free alpha on itch.io—while the PC build is fairly stable, the Mac build has not been tested at all, and I had more than a few problems trying to get it to run this morning. Kennedy promises that this is but a fraction of what the game will eventually have to offer, which is exciting, because I feel like I barely scratched the surface.